I know you are probably wondering why I didn’t start making jam until 10:00 pm. I cleaned and cut the strawberries the day before and put them in the refrigerator. I noticed they were ripening very quickly. I knew this was my last chance to make the jam since we would be at my son’s volleyball tournament and I was heading out of town in a few days. So I couldn’t justify wasting the $16 dollars I had spent on the berries. I started mixing all of the ingredients and ran into another problem. By tripling the recipe (because I had a gazillion strawberries) I realized I needed 21 CUPS OF SUGAR. I am not kidding. (Fourth mistake – using a Pioneer Woman recipe is never a healthy option!) By now it was 11:30 pm and I had to run up and change out of my jammies and back into street clothes for a trip to the grocery store. (Fifth mistake – check the ingredients before you change into your jammies) Once I had all of the ingredients the rest wasn’t hard. Until it came time to clean off the edges of the hot jars, placing the hot lids on the jars, boiling the filled jars, and turning them upside down to make sure the lid is sealed and in tack. By the time I was done I had twenty-one jars of jam (with one cup of sugar in each one, OMG!). My husband is happy as it is favorite. I don’t even like strawberry jam so if you see me in the next month or two I will happily gift you a jar. Or two. Or three. Next time I am at the grocery store I will buy a box of raspberries and blueberries and make one jar of refrigerator jam for me. That will probably take about fifteen minutes. And it will last a very long time. Place the mason jars in a large hot water bath canner (or pot). Cover with water and bring to a simmer. Simmer the center lids in a separate saucepan full of water. Place the mashed strawberries and lemon juice in a separate pot. Stir in the pectin until dissolved. 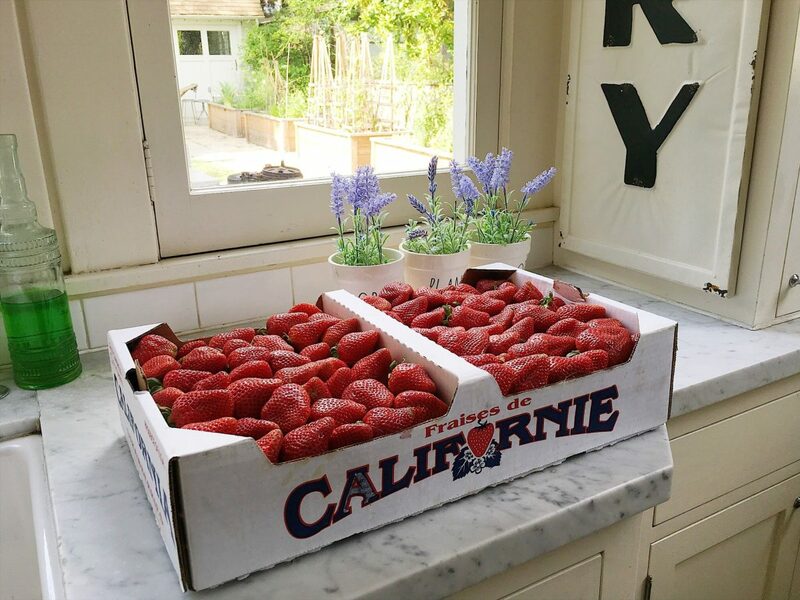 Bring the strawberries to a strong boil. Place the mashed strawberries and lemon juice in a separate pot. Stir in the pectin until dissolved. 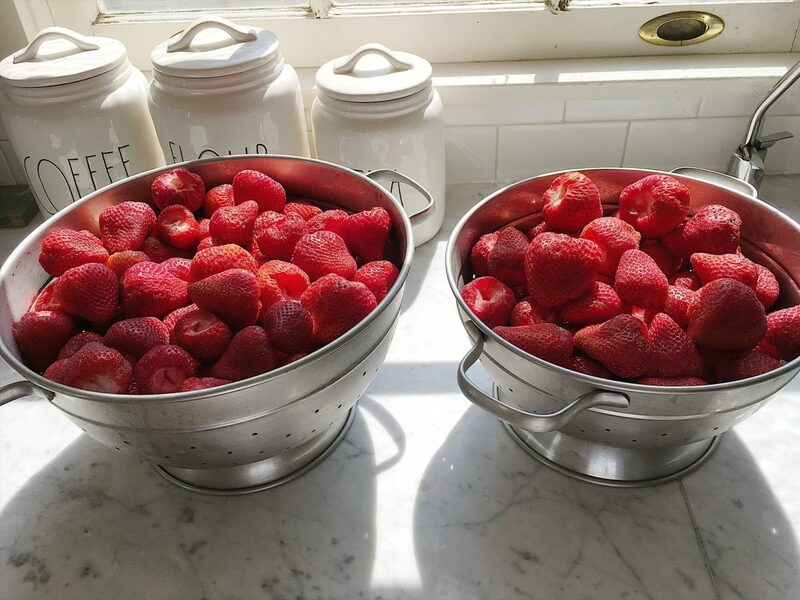 Bring the strawberries to a strong boil. Add the sugar (measure beforehand so you can add it all at once), and then return the mixture to a full (violent) boil that can’t be stirred down. Boil hard for 1 minute 15 seconds. Skim foam off the top. Add the sugar (measure beforehand so you can add it all at once), and then return the mixture to a full (violent) boil that can’t be stirred down. Boil hard for 1 minute 15 seconds. Skim foam off the top. Remove one jar at a time from the simmering water. Pour water back into the pot. Using a wide-mouth funnel, fill each jar with jam, being careful to keep the liquid/fruit ratio consistent. Fill the jars so that they have 1/4-inch of space at the top. Run a knife down the side of the jar to get rid of air bubbles. Wipe the rim of the jar with a wet cloth to remove any residue or stickiness. Remove one jar at a time from the simmering water. Pour water back into the pot. Using a wide-mouth funnel, fill each jar with jam, being careful to keep the liquid/fruit ratio consistent. Fill the jars so that they have 1/4-inch of space at the top. Run a knife down the side of the jar to get rid of air bubbles. Wipe the rim of the jar with a wet cloth to remove any residue or stickiness. Remove the center lid from the simmering water and position it on top. Put screw bands on jars, but do not over tighten! Repeat with all the jars, and then place the jars on a canning rack and lower into the water. Place the lid on the canner, and then bring the water to a full boil. Boil hard for 10 to 12 minutes. Remove the center lid from the simmering water and position it on top. Put screw bands on jars, but do not over tighten! Repeat with all the jars, and then place the jars on a canning rack and lower into the water. Place the lid on the canner, and then bring the water to a full boil. Boil hard for 10 to 12 minutes. Turn off the heat and allow the jars to remain in the hot water for an addition 5 minutes. Remove the jars from the water using a jar lifter, and allow them to sit undisturbed for 24 hours. Turn off the heat and allow the jars to remain in the hot water for an addition 5 minutes. Remove the jars from the water using a jar lifter, and allow them to sit undisturbed for 24 hours. After 24 hours, remove the screw bands and check the seal of the jars. The center lids should have no give whatsoever. If any seals are compromised, store those jars in the fridge. Otherwise, fill your pantry with your newly canned goodness. 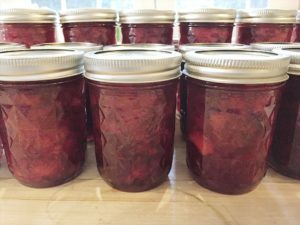 So… have you ever made strawberry jam? Please tell me it went smoother than this!! That was JUST what I needed to read this morning! I actually laughed out loud at least three times! You’re very witty and I loved reading this! I’m allergic to strawberries sooo no more strawberry jam making for me, but I make other fruit preserves,jams and jellies. I freeze my berries, either sliced or whole, in plastic containers in the amount called for on the MCP pectin box for a single batch. Then I make jam as needed, one batch at a time. Of course you need more freezer space rather than pantry space.